Click any of the above for a FREE demo! Audio Production: You’ve heard the old saying, “You can have it good, and you can have it fast, but, you can’t have it good and fast”. Well, that’s not necessarily true. 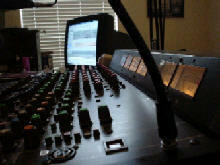 For commercials, industrial narrations, or, finished audio production, if you need a quick turnaround, call me. E-mail the copy to me at dangallo@dangalloproductions.com, and I’ll crank it out. If you need copy written, no problem. I've written enough copy during my career to fill a couple advertising agencies. After producing your spots, I can e-mail them to their destination as a high-grade MP3, or send them to you through our FTP as an AIFF, or wav. file. Simple, quick, and good. One more thing….I’ll work late on Fridays, too. With nearly thirty years’ production experience, I can get you on the air in next to no time. If you're located in the Houston/Sugar Land area and want to attend a session, you're more than welcome. The coffee is hot, the soft drinks are cold, and, during breaks, you can soak your feet in the pool. If you're outside the Houston area, but, you want to direct the session, I can hook you up through the phone. I'm the one you want to call when "you need it now!"